Anyway, the story immediately reminded me of a previous go-round of antivaccine lunacy. 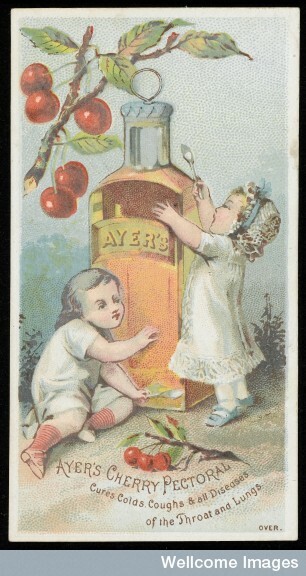 In the mid-1970s, pertussis (whooping cough) incidence had dropped spectacularly, as a result of vaccination. With unfamiliarity came contempt; people forgot what whooping cough was like, and anti-vaccine loons crawled out from under their rocks and started peddling spurious links between vaccine reactions and various problems. Parents fell prey to the alarmists, and stopped vaccinating their children. Unsurprisingly, whooping cough re-emerged as a killer. In England, for example, whooping cough incidence had dropped from 200-400 cases per 100,000, prevaccine, to … well, I can’t read it off the graph because it’s too low, but something much less than that. 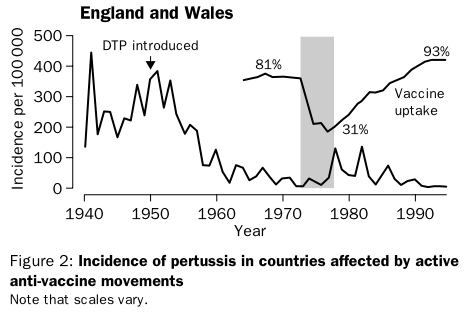 Unsurprisingly, pertussis rates promptly climbed back up, with the classic epidemic spikes that parents in 1950s had been grimly familiar with. And now, history is repeating itself: antivaccine loons are responsible for another child’s death: Last year a 13-year-old boy, from a travelling community in the North-West, became the first person to die of measles since 1992.